THE reason it's so hard to reconcile this Kildare team as being the same one that lost to Carlow on May 27th is because so most of the areas of improvements they have undergone in the mean time can categorised as intangible. Energy, momentum, confidence – all qualities Cian O'Neill's team flat-lined on that day in Tullamore. Even their impressively optimistic support had given up on them as they lurched towards a full calendar year without a win and a dozen consecutive losses to show for their annual effort. This evening, they secured their spot in the inaugural ‘Super 8s' by blitzing Ulster finalists, Fermanagh, by 11 points in Navan. It's less than six weeks since that Carlow game but they have undergone a startlingly quick renaissance in that time. They'll play Monaghan or Laois in Croke Park next Saturday before welcoming Galway to the GAA's newly-most celebrated cauldron, Newbridge in Group 1 of the officially-titled All-Ireland quarter-final group stage. On this form, you wouldn't preclude them from winning either. Suspicions that Kildare might find it difficult to summon the adrenaline for this after last week's insurrection against Croke Park and Mayo proved spectacularly wrong. They began here in a flurry of purposeful movement. Fergal Conway set the tone but Daniel Flynn, at full-forward, did the damage. They did, however, survive an early scare when Ryan Jones lobbed Mark Donnellan only for the ball to bounce inexplicably the ‘wrong' side of the line for a goal. But Donnellan found his men from medium range in all but one of his kick outs in that half. And every Kildare possession seemed to have a scoring chance at the end of it. During their run of defeats in the League, O'Neill reckoned his team's conversion rate was somewhere around 32%. In the first half this evening, they scored 1-13 off 16 shots. Tactically too, they were unrecognisible from the confused bunch that wandered haplessly and often into the thicket of bodies in front of the Carlow goal in O'Connor Park that day. Frequently during the match, O'Neill could be seen imploring his wing-forwards and corner man to retain their width, surfing the touchline and pinched into their alcoves. That opened gaps for Conway, Paul Cribbin and Kevin Flynn to punch through and once Daniel Flynn got their goal after seven minutes from a high delivery from Conway, Fermanagh – with their frustrate and counter game - were in trouble. 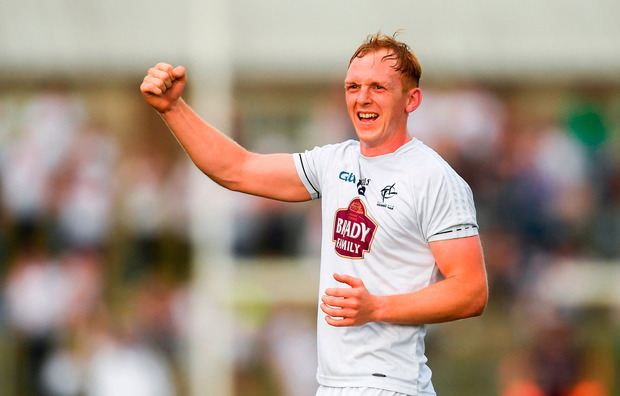 O'Neill even pushed Eoin Doyle up as an extra unmarked attacker on occasion and the Kildare captain's unexpected presence so high up the pitch caused two goal chances for Kildare. The second of which fell to Neil Flynn early in the second half after a brilliant tap-down from Tommy Moolick. That goal was the fruits of the best move of the match and the signal for the end of it as a contest with more than half an hour to play. Seán Quigley kicked three from play for Fermanagh after coming on and Rory Gallagher's team did kick eight points to Kildare's two in the middle part of the second half but their comeback was never enough to rattle the re-energised Kildare support. By the 55th minute, O'Neill had removed Daniel Flynn and Kevin Feely, presumably to rest for bigger days to come. Each got a forceful high five from their manager and a hearty pat on the back as they retreated to the bench. It's the least they deserved after salvaging something from a season that six weeks ago, wasn't worth rescuing. SCORERS – Kildare: N Flynn 1-5 (0-3f), D Flynn 1-3, C Healy 1-2, K Flynn, F Conway, P Brophy 0-2 each, P Kelly, K Feely, T Moolick, P Cribbin, K Cribbin 0-1 each. Fermanagh: Seamus Quigley 0-8 (6f, 1 '45), Seán Quigley 0-3, R Jones, T Corrigan 0-2 each, J McMahon, D McCusker, R Corrigan 0-1 each. FERMANAGH: P Cadden; B Mulrone, C Cullen, M Jones; L Cullen, D McCusker, A Breen; T Clarke, E Donnelly; D Teague, R Jones, J McMahon; R Corrigan, Seamus Quigley, C Jones. Subs: K Connor for D Teague (24), T Corrigan for Breen (32), R Lyons for Jones (h-t), C Clarke for McCusker (44), Seán Quigley for R Corrigan (46), C McGee for Mulrone (58). Independent.ie Sportsdesk Monaghan got the defence of their title off to a winning start when they came with a late flurry to defeat Down in this entertaining contest in Clones on Saturday. Michael Verney Clare will be without one of their most potent attackers for this year's championship campaign as Keelan Sexton has opted out of the Banner football fold to travel Stateside for the summer.